Sony is going to introduce its latest flagship smartphone Xperia XZ4 at MWC 2019. 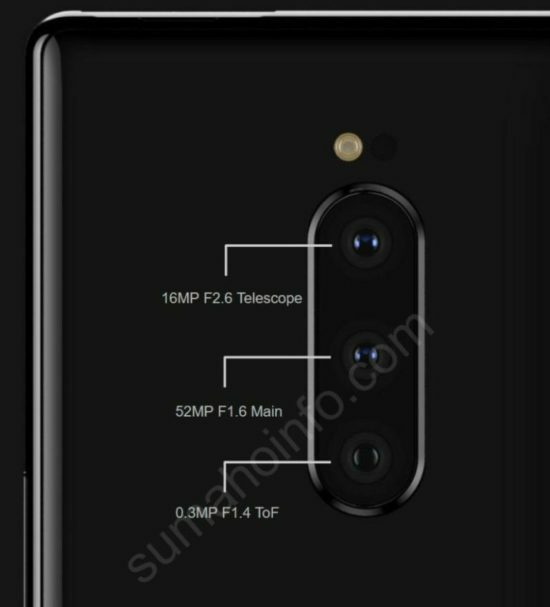 And just before that, one image has surfaced which shows triple rear cameras with a 52MP sensor (f//1.6 aperture) for the primary camera. The other two sensors will be a 16MP telephoto lens with f/2.6 aperture and 0.3MP ToF sensor. We have seen the trend of high-resolution camera smartphones before. A few weeks back Honor View 20 and the Redmi Note 7 was launched with the 48MP sensor. Sony is bringing ToF sensor that will help in autofocus to increase its speed. On Reddit, some live images were also leaked. Some rumors also are saying that this smartphone will feature ToF sensor on the front. These informations are based on leaks and rumors so take it with a pinch of salt. We have to wait for the MWC 2019 to know all the details.